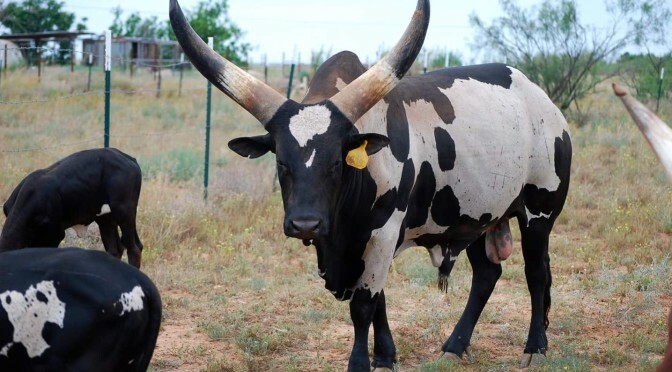 Burnett’s Republican, or Oreo as breeder Jessica Alvarez calls him, was purchased by The Watusi Ranch in 2012 at 2 years old. Sired by Heiken’s Ark Bon Fire and out of dam China Doll, this foundation pure bull’s black and white genetics have proven to be dominant, coloring 5 out of 6 of his 2015 calves out of 5 red and white cows. As you can tell from the photos below, Oreo is a very photogenic Watusi bull whose favorite pastime is sticking his horns in the dirt and tossing it in the air. 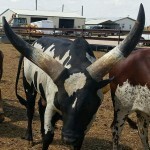 The Watusi Ranch has several of his calves for sale; visit them on Facebook or send them an email. Herdsire Spotlight showcases a current herdsire from a WWA member and give everyone more opportunity to marvel at these beautiful creatures. If you have a herdsire you’d like to spotlight, please send an email to info@watusi.org.